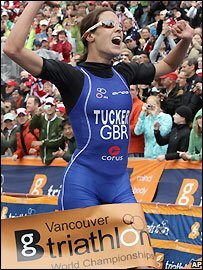 Britain's Helen Tucker warmed up for the Beijing Olympics in style as she won the Triathlon World Championships in Vancouver. Tucker, 25, finished four seconds ahead of American Sarah Haskins with New Zealand's Samantha Warriner third. After breaking away during the bike leg, the leading pair ran side-by-side for 9.9km before the Welsh athlete out-sprinted the American to win. Fellow Brit Alistair Brownlee won the men's under 23 title. Tucker, who is from Bridgend, secured her place in Great Britain's Olympic squad after coming second at the Madrid World Cup at the end of May. But victory in Canada still came as a huge shock for the Welsh triathlete, who has struggled with an ankle injury since 2006, and she admitted after the race she had contemplated not running at the World Championships. "Vancouver is my new favourite place," said a delighted Tucker, who crossed the line in two hours, one minute and 37 seconds. "It's not going to sink in for a few days. I wasn't planning on coming to the worlds, it was kind of a last-minute decision. I'm glad I did now. "The cold weather definitely made it harder, coming out of the swim my feet were really numb and tiredness started to set in a lot quicker on the bike." Tucker's surprise win means she becomes just the second British woman to win an elite world championship after Leanda Cave's 2003 success in Cancun, Mexico. The Americans and Brits held the first five positions coming out of the water with pre-race favourite and reigning champion Vanessa Fernandes down in seventh, the Portuguese eventually finishing 10th. After breaking away during the second lap on the testing bike course, Haskins was first out of the second transition five seconds ahead of Tucker. The pair were virtually inseparable during the 10k run, but it was the Brit who exited the final turn in front and powered home for the win. Brownlee, 20, dominated the international field in his race as the Olympic hopeful coasted to victory in wet conditions to finish 19 seconds ahead of last year's champion Gregor Buchholz. New Zealand's Martin Van Barneveld won bronze, while Britain's Todd Leckie finished just outside the medals in fourth on his world championships debut. In the men's senior race Spain's Javier Gomez finished 24 seconds ahead of 2004 Olympics silver medallist Bevan Docherty of New Zealand, with Switzerland's Reto Hug third. Britain's Oliver Freeman, who will not be going to the Olympics, finished down in 15th place. Several big-name triathletes going to the Olympics - including Britain's 2006 world champion Tim Don - did not take part in the Worlds, prefering to concentrate on their preparations for Beijing.